Rating: I don't really feel qualified to "rate" this book--see why below. 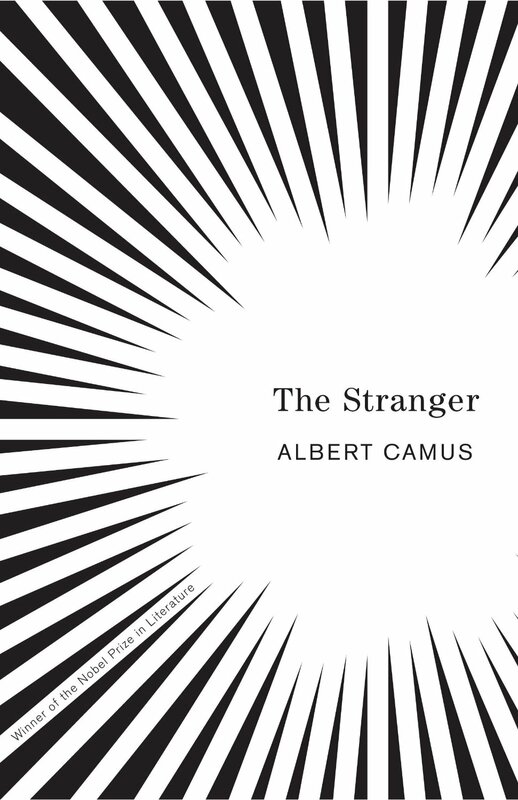 I bought The Stranger a few weeks ago at a used bookstore because it was cheap and it rang a bell in my head as a "classic" I should probably read at some point. I knew nothing about it going in, except that it's pretty short--only about 150 pages. The book opens with the narrator, Meursault, explaining that his mother has passed away. He doesn't seem to be experiencing any grief, and when he gets to the home where his mother lives, refuses to view the body but instead spends the night sitting by the closed casket, drinking coffee and smoking. Upon returning home after the funeral, he begins dating a former coworker, Marie, and befriends a man named Raymond, who lives in his building. His friendship with Raymond is built upon Meursault agreeing to assist Raymond in writing a letter to Raymond's ex-girlfriend, luring her to the building so that Raymond can get back at her by pretending he wants to sleep with her before kicking her out at the last minute. Raymond later invites Meursault and Marie to a friend's beach house, where brothers of the girl Raymond spurned (described as "Arabs") injure Raymond in a fight. Later, Meursault takes a walk on the beach, and runs into the same Arab who hurt Raymond. Having taken Raymond's pistol with him so Raymond wouldn't do anything rash, Meursault, on the verge of heatstroke, kills the Arab after seeing the flash of his knife. Even though he killed the Arab with the first shot, he fires three more times. The rest of the book describes Meursault's stay in jail, his trial, and his sentencing. Throughout, he neither feels nor expresses any remorse for what he did. His generally detached personality makes living in prison relatively easy, and he soon gets used to not being able to go where and do what he pleases. He mostly seems bored with everyone and everything, and often refers to things "happening to" him, as though he himself has no agency at all. I'll be the first to admit that if there's a point to this book (and Wikipedia seems to suggest there is), it went straight over my head. It seemed a lot like a somewhat uneventful snapshot of some random guy's life, of course interrupted by more or less cold-blooded murder, but still. It wasn't badly written by any means, but it just seemed pointless to me. I probably haven't read nearly enough philosophy to get it. But maybe the seeming pointlessness of the story mirrors the pointlessness of...life?? Who knows. Anyway, due to my complete ignorance of any and all philosophical schools of thought that this book may or may not be espousing, I really can't give this book a fair rating. Check out what Wikipedia says about this book and the philosophies it might be examples of, read about those, and maybe then tackle this book. Good old existentialism! I had taught that school of thought to my students last year when we read Metamorphosis by Kafka- it's a tough concept! I read this in high school, and remember loving it. I should really read it again. It's a fascinating exploration of existentialism and removing all emotion out of life. IMO - an insight into the brain of a sociopath?? I'm sure I'd feel different reading it now as a 30-something than I did as a 17 year old! Probably not an easy book to read, but thanks for sharing it. I love to hear about all books, not just the ones I have read. Truthfully, I never heard of it before, but I have heard of the author. I read it in high school as well, but am long overdue for a re-read (I'm not a big re-reader of books). This was a toughie to get through, though. I don't think it was ever made into a movie either. Sometimes, with classics, watching them unfold on the screen helps a little with understanding what the author was going for.